As we celebrate the launch of SANCTUM, the twelfth Dark Mountain book, we've asked the writers and artists involved to introduce different aspects of this special issue. 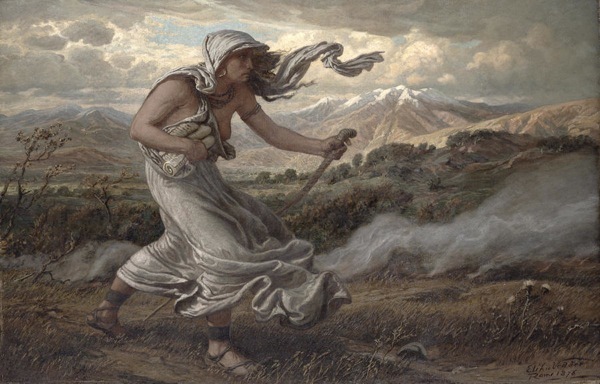 Today, Sylvia V. Linsteadt explains how she and Rima Staines summoned the voice of the Sibyl of Cumae to inhabit the margins of the book's twelve essays, and then to claim the final word. As the book's 'Marginalians', they created a mythic narrative that weaves the book's individual pieces into a larger whole. is a writer and animal tracker living in the hills of Point Reyes, just north of where she was born. Her first novel Tatterdemalion, a collaboration with artist Rima Staines, was published with Unbound in 2017. To be honest, I was a little bit afraid. If you were to have glanced in my studio window while I was at work on the marginalia for SANCTUM (as generally only chipmunks, spotted towhees, quail and my neighbour’s dog Siri are wont to do), you would have seen me bent over my notebook, wearing a dry summer crown of mugwort and yarrow. Boundaries, you know, must be kept. Yarrow is good for that; so the witches teach. Swa wiccan taeca∂. So the witches taught in the old lore of Europe. Yarrow to stanch blood. Yarrow to sweat out a fever. Yarrow for protection against what is unseen. I’d decided this was a good idea, since I was writing in the voice of the Sibyl of Cumae who walked the underworld and prophesied among the dead as well as the oak leaves of a tree outside her cave. I’ve learned the hard way that opening your mind wide for the mythic material of story-making to fall in isn’t always a safe undertaking, psychologically speaking. That it’s good to make a ritual approach each morning at the writing desk. To listen for the sound of threads growing thin in the mind, and stop short of any breaking. To always remember that the words and stories come from elsewhere, and to give back when it’s done. Given that the Sibyl of Cumae was the guardian of a prophetic serpent cavern which led to the underworld, I thought a yarrow crown while I wrote would, at least, not do any harm besides convince my brother (who lives nearby) and my elderly neighbour (who lives upstairs) that I’m every bit as odd as they already lovingly believed, and at best, might serve as a bit of a buffer. When Dougald and Steve first approached me about being the Marginalian for SANCTUM, and also writing the book’s thirteenth essay (a kind of lunar counterpart to the solar twelve, they described it, a feminine balance to the masculine structure of the essay), I wasn’t at all sure what to do, but I knew I had to do it, because I’d been obsessed for months with pre-Hellenic Greek cosmologies and the preponderance of serpents, women with serpents, earth-serpents, prophetic caverns, Titans, priestesses and ancient female power I found there. Somehow, the margins of this book about nature and the sacred seemed an excellent place to set them loose. The word ‘marginalia’ immediately called to my mind images of medieval illuminated manuscripts whose margins had been doodled in by daydreaming monks. Such scribblings and illustrations bring a book to life in a way that the careful lettering and central text, no matter how beautiful, never quite do. While the text may carry the central intellectual message of the book, the marginalia reveals its life as an object in a pair of human hands, processed by a human mind and heart. Of course, marginalia in the traditional sense have almost always been written by men upon other men’s pages. So the idea of slipping a subversive, serpentine, sensuously embodied female voice into the margins of a book, any book, seemed a thrilling and fecund idea indeed. The Sibyl of Cumae. 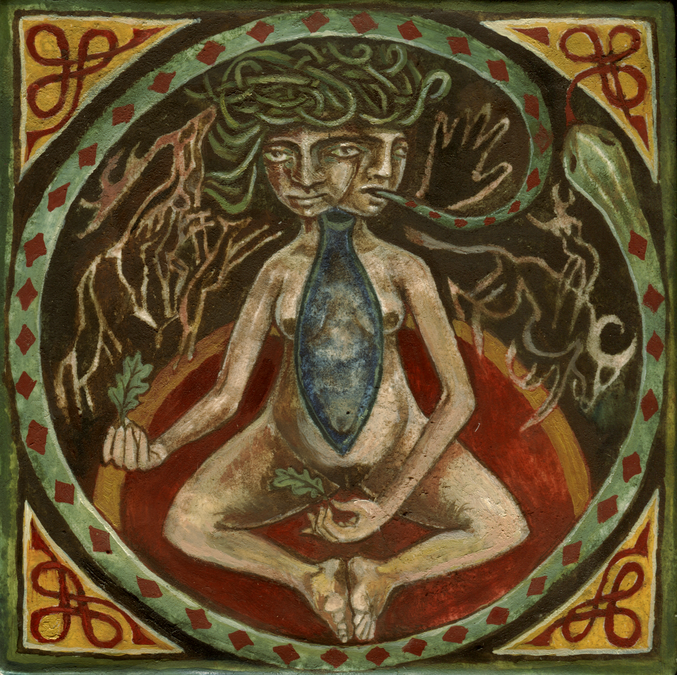 A woman in a cave who spoke to the dead; a snake-seer; a woman of the old ways, of a time before rampant patriarchy. I’d been to Italy in the spring, very near Naples and Cumae, where she (or the long lineage of seers who held the title) was said to have lived. I visited an old Asklepion dream-temple in a hilltop village, where it was said the priestesses spoke to snakes in order to help their patients interpret their dreams and find healing through them, and that these snakes were buried in urns when they died, which were then mortared into the walls. 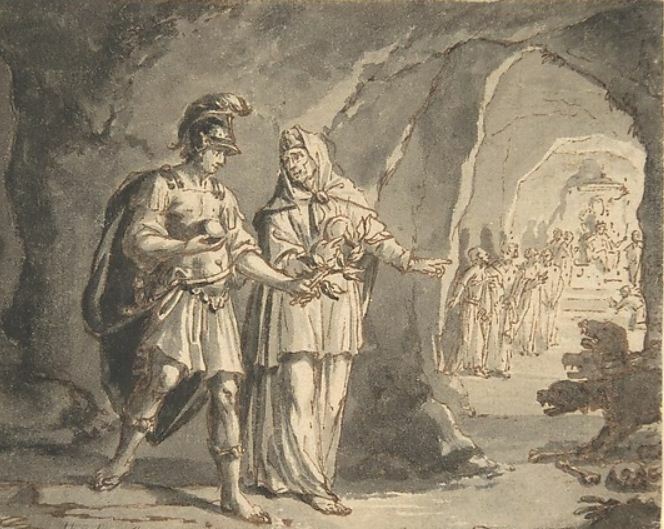 I wondered how long before the coming of the Greeks the indigenous women of Italy had interacted ritually with snakes, and holy caves, and dreams. I wondered if the Sibyl of Cumae, who, as Virgil wrote, was visited by Aeneas on his journey to settle Latium and begin the lineage that would spawn Rome, was a fragment of a much more ancient and indigenous Italic heritage. I imagined my way into her voice in order to find out; not because fiction as a rule is a very good way to discover the truth about the prehistoric past, but because it opens new doorways in the mind that reason and research alone cannot. Virgil wrote about her; Ovid wrote about her; T.S. Eliot too. Michelangelo painted her, and a dozen others. Always she was written or bodied by men, her voice given to her by their own words. I wanted to give her a female voice for once, and try to let her tell her own story as I imagined it from a female perspective, to set her free in the margins and see what happened. And it seemed suitable that she might dwell in the pages of a book. 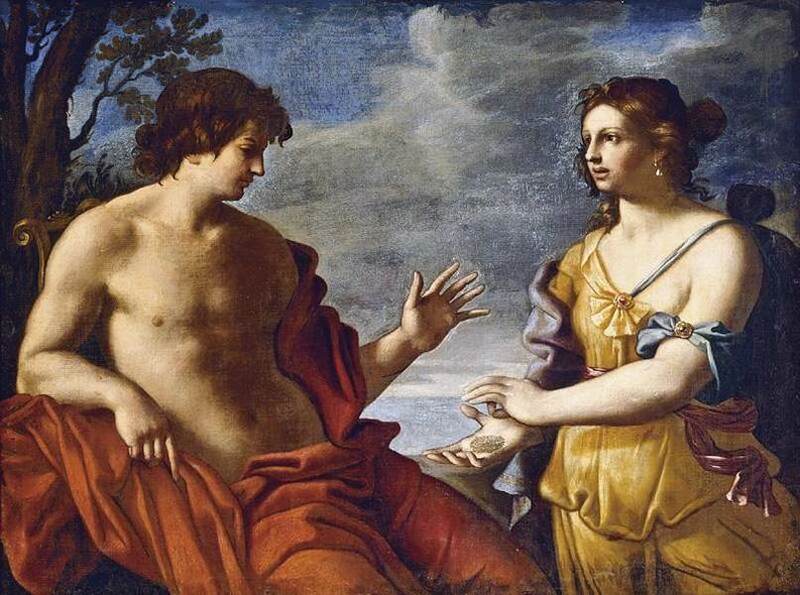 After all, according to Ovid, and later Petronius, she was an old woman for thousands of years, eventually ageing to little more than a wisp of voice due to a curse laid on her by Apollo (because she wouldn’t sleep with him). Presumably, a wisp of voice might fit anywhere– in an ampulla, where she was indeed stuck for many centuries, or in a book . . . This act of setting the Sibyl free in the margins, so to speak, also did something interesting to the book as a whole. It transformed it into an oddly fantastical object that was no longer only a collection of essays. 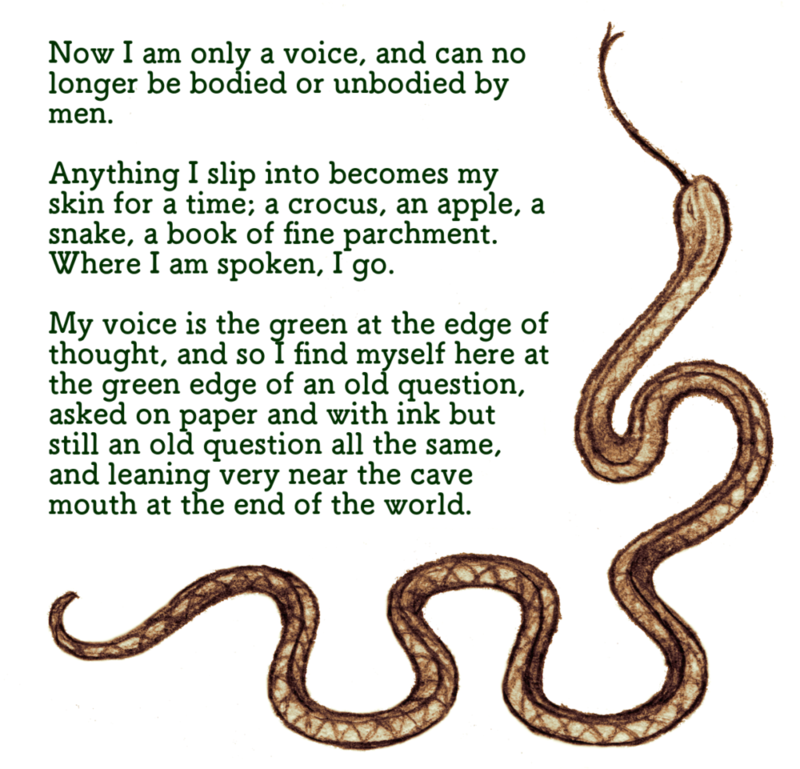 A Sibyl snakes in green text throughout the edges, offering her fiercely feminine commentary on the words gathered there. Her reflections culminate in a story of the present and the future, which involves the very book in which she has settled her green and weedy words. What’s more, it is the inimitable Rima Staines whose artwork accompanies the Sibyl’s words throughout the margins, and onward to the very end where it comes together in three of Rima’s most powerful, darkly feminine paintings, done on deer parchment prepared by the book’s art editor Thomas Keyes. As regular readers of Dark Mountain may know, Rima and I created the novel Tatterdemalion together, working in a rather back-to-front manner. My words were written to illustrate a collection of her paintings, spanning many years of her work, rather than the other way around. This project was equally unusual, though smaller in scale. In this case, I wrote the words first and gave them to Rima to transmute into images with her pen and brush, but the manner in which we did it was still from the outside in, from the edges toward the center, both of us excavating primordial wellsprings where female serpent-deities dwelt, both of us exploring the cultural margins of a kind of dark feminine spirituality, as well as the literal book margins, trying to blur the boundaries between object and living text. This book is about the concept of the sacred as it relates to our understanding of and interactions with the environment, the natural world, the living wild land, the whole Earth. Writing in the Sibyl’s voice as a way to think through the ideas put forth in SANCTUM, exploring her perspective and her story at the text’s edge, allowed the conversation happening within the book and between the essays to widen, to become stranger, to take a step beyond reason and into the realm of the imaginal. This is one of the things that fiction (and storytelling, and myth) can do for us. It activates the deep well of mystery that dwells at the mind’s root. It stirs up the Dreaming, and ultimately orients us back into the living world. I hope that the Sibyl’s words offer something of this kind through SANCTUM. They certainly did for me in the writing of them. And I hope that you too may use this book, as she does, to divine what stirs in the darkness of your own heart, and in the darkness of our planetary future. In the cave they are painting serpents on the walls in black and red and gold. In the cave the last mother of the old world nurses her son of stone. In the cave the first mother of the next world nurses her son of blood. Sanctum is, for me a great success, and your marginalia is the star of the show. Thank you, and Rima as well. And, yes, I have ordered a copy of Tatterdemalion and urge other readers to do the same. Thank you Albert, what very kind words. I am so glad the marginalia & their Sibyl spoke to you! I finished Sanctum & your essay on the night before I left to spend several days camped at the bottom of a deep coastal canyon, miles from the nearest road. To see the setting of the story change from ancient Greece to California’s coastal forest was doubly powerful for me since oaks, bay laurels and madrones watch over me as I spend several days a year in complete solitude. The essay was a very creative use of history, mythology & setting. The story was compelling in its own right. But adding the local flavor gave it an almost magical quality for me. When I finished, I told my wife that I felt as though I had just completed a journey through time and space. Well done!